Phylogenetic relationships of extant salamandrids (Steinfartz et al., 2006; Weisrock et al., 2006). For more information on extinct genera, see Estes (1981) and Duellman and Trueb (1986). Salamanders of the family Salamandridae are informally subdivided into two major subgroups, the "true salamanders" (includes genera Chioglossa, Lyciasalamandra, Mertensiella and Salamandra) and the newts (includes all remaining extant genera). Both groups have aquatic larvae except for some viviparous true salamanders (Lyciasalamandra, Salamandra atra, S. lanzai, some Spanish populations of Salamandra salamandra, and some Moroccan populations of Salamandra algira) that give birth to fully metamorphosed offspring. Metamorphosed adults of the true salamanders are highly terrestrial whereas those of newts are at least partly aquatic, and some are entirely aquatic. Some newts of the North American genus Notophthalmus have a particularly complex life cycle with two metamorphoses and three distinct developmental stages: an aquatic larva, a terrestrial juvenile (the "red eft") and a secondarily aquatic adult. The family Salamandridae has a holarctic distribution and is well represented in Europe, Asia, and North America. The true salamanders are almost entirely European in distribution, except for some peripheral populations of Salamandra infraimmaculata and S. semenovi located in the Middle East (Iran, Iraq, Israel, Lebanon, Syria, and Turkey), Salamandra algira from northwest Africa (northern Algeria and Morocco), and the genus Lyciasalamandra in southern Turkey and some Aegean islands. Habitats favored by the true salamanders include burrows and refuges located under logs or stones in moist woodlands and subalpine meadows. The true salamanders are generally secretive and are active on the surface only on mild, damp nights. The newts are more widespread in distribution, covering most of Europe and including species located in southeastern China and northern Laos and Vietnam, the Middle East, northwestern Africa and North America. All newts have aquatic larvae and some, such as members of the Chinese genus Pachytriton, are strictly aquatic also as adults. 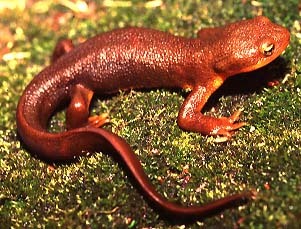 Other newts are largely terrestrial as adults, but all must return to ponds or streams to reproduce. All salamandrids have toxic skin secretions, and newts are highly poisonous in all stages of their life history. Many salamandrids have bright colors that serve as warnings of their toxicity and may be used in defensive displays. For a detailed review of the biology, reproduction and diversity of salamandrids, see Griffiths (1996) for European species and Zhao et al. (1988) for Asian species. Halstead (1992) comments on toxicity of newts. Titus and Larson (1995), Steinfartz et al. (2006), and Weisrock et al. (2006) analyzed phylogenetic relationships within the family Salamandridae. Montori and Herrero (2004) reviewed the systematics and taxonomy of salamandrids inhabiting the Iberian Peninsula and the Balearic Islands. Relationships of salamandrids to salamanders of other families are summarized by Larson and Dimmick (1993). For a comprehensive listing of extant species, see Frost (2006) and AmphibiaWeb. For fossils, see Estes (1981) and Duellman and Trueb (1986). See also Nussbaum et al. (1995) for taxonomic changes in the genus Tylototriton. Newts of the family Salamandridae are unlike all other salamanders in having rough-textured skin that is not slimy. Costal grooves usually are not distinct. Most salamandrids have a biphasic life history with aquatic larvae and metamorphosed adults that may be terrestrial or aquatic. The tail is finlike in aquatic forms but not in terrestrial forms. Larvae have four pairs of gill slits and large external gills. Legs are relatively long, prominent and robust. The morphological characters given below are the ones standardly used to diagnose the salamander family Salamandridae and to assess its phylogenetic relationships to other salamanders. The individual characteristics are in most cases shared with other salamanders and are not synapomorphies of the Salamandridae. Absence of characteristics found in other salamanders is noted where it is important for distinguishing salamandrids from other salamanders and/or determining their relationships to other salamanders. These characteristics were assembled from a large number of original sources by Duellman and Trueb (1986), Larson (1991) and Larson and Dimmick (1993). See "Discussion of Character Evolution" below for comments on some interesting evolutionary trends occurring within the Salamandridae. The premaxilla may consist of a single bone or separated, paired bones. The angular bone is fused to the mandible. A frontosquamosal arch is present in some genera. Bilaterally paired nasal bones each ossify from a single, laterally positioned anlage; long posterior processes of the premaxillae extend between the paired nasal bones and completely separate them. Septomaxillary bones are absent. Lacrimal bone is absent. Quadratojugal bone is absent. Pterygoid bones are present. Internal carotid foramina are absent from parasphenoid bones. Ear bones feature fusion of the columella with the ear capsule, and a free operculum. Replacement of vomerine teeth proceeds medially. Teeth have a distinct crown and pedicel. Origin of the levator mandibulae anterior superficialis muscle includes the exoccipital. A basilaris complex is present in the inner ear of some species and absent from others. The recessus amphibiorum is oriented horizontally in the inner ear. The otic sac is multilobate, vascularized and filled with calcium. Fibrous connective tissue is present around the amphibian periotic canal. The periotic cistern is small. The periotic cistern may or may not protrude into the fenestra. The first hypobranchial and first ceratobranchial (alternatively homologized as the first ceratobranchial and first epibranchial, respectively) exist as separate structures in most species, but are fused into a single structure in several genera. The second ceratobranchial (alternatively homologized as the second epibranchial) comprises a single element. Lungs are present but greatly reduced in some species. An ypsiloid cartilage is present. Larvae have four pairs of gill slits and large external gills. The scapula and coracoid bones of the pectoral girdle are fused to form the scapulocoracoid. Vertebral centra are opisthocoelous. Ribs are bicapitate. Spinal-nerve foramina are present in neural arches of all vertebrae except for spinal nerves exiting between the atlas and first trunk vertebra. The pubotibialis and puboischiotibialis exist as separate muscles. Anterior glomeruli of the kidney are reduced or absent. Fertilization is internal. Ciliated epithelium may be present or absent in the cloacal tube and anterior cloacal chamber of females. Epidermal lining is absent from the anterior cloacal chamber of females. Evaginations are absent from the dorsolateral walls of the male cloacal tube. Anterior ventral glands are present in the cloacae of females. Spermathecae are present in the female cloacal chamber. Glands secreting into the dorsal walls of the female cloaca are absent. Anterior ventral glands are present in male cloacae. Posterior ventral glands are present in male cloacae. Kingsbury's glands are present in male cloacae. Dorsal pelvic glands are present in males. Lateral pelvic glands are absent in males. Glands secreting into the male cloacal orifice are present. Parental care of eggs has not been reported. The diploid number of chromosomes is 22 (Notophthalmus and Taricha) or 24 (see Morescalchi, 1975). Although taxonomists generally have accepted the hypothesis of monophyly for extant salamandrid genera, evidence for salamandrid monophyly rests mainly on recent molecular data (Larson, 1991; Titus and Larson, 1995; Weisrock et al., 2006). The "true salamanders" and "newts" are not recognized as formal taxa, although the results of Titus and Larson (1995), Steinfartz et al. (2006), and Weisrock et al. (2006) are compatible with the interpretation that these groupings represent monophyletic sister taxa and potentially could be recognized as subfamilies. Monophyly of "true salamanders" is supported by the molecular studies of Veith et al. (1998), Weisrock et al. (2001), and Steinfartz et al. (2006). The exact phylogenetic position of the newt, Salamandrina terdigitata, is uncertain (see below) and requires better resolution before we can be confident that the newts form a monophyletic group. Recent molecular studies (Weisrock et al., 2006) have validated earlier studies that suggested that Mertensiella, Euproctus and Triturus were polyphyletic assemblages and taxonomic changes have resulted. Species of Triturus have been placed in Lissotriton, Mesotriton (Montori and Herrero, 2004), Ommatotriton (Litvinchuk et al., 2005) and Triturus, species of Mertensiella in Lyciasalamandra and Mertensiella (Veith and Steinfartz, 2004), and species of Euproctus in Calotriton and Euproctus (Montori and Herrero, 2004). Features such as a cutaneous dorsal spine above the base of the tail that functions in courtship behavior were thought to be unique to Mertensiella but have evolved homoplastically. Lyciasalamandra is very closely related to Salamandra and could easily be recognized as a component of that genus, as earlier work on osteology suggested (Özeti, 1967). Titus and Larson (1995) reviewed 48 morphological and reproductive characteristics for members of the Salamandridae (see also Özeti and Wake, 1969; Wake and Özeti, 1969; Sever, 1992). No single feature uniquely characterizes all salamandrids as a monophyletic group, but a combined analysis of these characters and variation in mitochondrial DNA sequence data strongly supports monophyly of the Salamandridae. This analysis of the combined morphological and molecular characters gives strong support to the monophyly of the true salamanders (genera Chioglossa, Lyciasalamandra, Mertensiella and Salamandra) and to monophyly of a group containing all newts except Salamandrina terdigitata. The genus Salamandrina appears to be the sole extant representative of an ancient lineage that separated from other salamandrid lineages near the time that the lineages leading to the remaining newts and to the true salamanders were formed. The phylogenetic position of Salamandrina is uncertain. Partitioned Bayesian analyses group Salamandrina with the true salamanders, while parsimony analyses place it sister to the newts (Weisrock et al., 2006). Salamandrina is clearly only a distant relative of the other salamandrid genera, and we can be fairly confident that it does not belong within either the clade containing the remaining newts or the clade containing the true salamanders. Within the true salamanders, a clade comprising Chioglossa and Mertensiella is sister to a clade containing Salamandra and Lyciasalamandra (Veith et al., 1998; Weisrock et al., 2001, 2006; Steinfartz et al., 2006). Salamandra and Lyciasalamandra each form clades, and the major lineages of both form polytomies (Steinfartz et al., 2000, 2006; Barroso and Bogaerts, 2003; García-París et al., 2003; Weisrock et al., 2006). Within the newt clade, the Asian genera Echinotriton and Tylototriton are monophyletic and together form a clade with the European and North African Pleurodeles, sister to the remaining newts (except Salamandrina; Hayashi and Matsui, 1989; Titus and Larson, 1995; Veith et al., 2004; Steinfartz et al., 2006). The North American genera Notophthalmus and Taricha form a clade sister to all other newts except Echinotriton, Pleurodeles, Salamandrina, and Tylotriton (Steinfartz et al., 2006; Weisrock et al., 2006). Calotriton, Cynops, Euproctus, Lissotriton, Mesotriton, Neurergus, Ommatotriton, Pachytriton, Paramesotriton, and Triturus together form a clade (Weisrock et al., 2006). Within this clade, a clade comprising the Asian genera Cynops, Pachytriton and Paramesotriton is supported (Hayashi and Matsui, 1988, 1989; Titus and Larson, 1995; Chan et al., 2001; Steinfartz et al., 2006; Weisrock et al., 2006). However, Pachytriton is the only genus in this clade that is monophyletic (Chan et al., 2001; Weisrock et al., 2006). The genera Neurergus and Euproctus are each monophyletic, and Euproctus is the sister taxon to a clade comprising Calotriton, Pachytriton, Paramesotriton, and Triturus (Weisrock et al., 2006). Calotriton is sister to Triturus (sensu Montori and Herrero, 2004). Steinfartz et al. (2006) recovered Triturus as a non-monophyletic (holophyletic) species assemblage comprising four monophyletic groups: (i) large-bodied Triturus (six species); (ii) small-bodied Triturus (five species; Lissotriton sensu Montori and Herrero, 2004); (iii) T. alpestris (Mesotriton alpestris sensu Montori and Herrero, 2004); and (iv) T. vittatus (Ommatotriton sensu Litvinchuk et al., 2005). Knowledge of phylogenetic relationships permits interpretation of the evolution of several morphological characters that have been important in the evolutionary diversification of salamandrids. Rough, keratinized skin characterizes all newts except the highly aquatic species, Pachytriton labiatus. Rough skin appears to have evolved in a common ancestor of the newts after their separation from the true salamanders, followed by loss of keratinized skin in the Pachytriton lineage. Courtship in salamandrids can be classified into four general groups based on the degree of contact between the male and female (Houck and Arnold, 2003). Male salamandrids may actively capture the female on its ventral surface (Mertensiella, Salamandra, Pleurodeles, and Tylototriton), dorsal surface (Notophthalmus and Taricha), or tail (Euproctus and Calotriton), or make no physical contact with the female at all (Cynops, Neurergus, Paramesotriton, Pachytriton, and Triturus). Absence of physical contact between the sexes is considered the ancestral condition for salamandrids, and additional data on the courtship of Salamandrina (which currently is unknown) are required to clarify the evolutionary sequence of changes in courtship behavior. Caudal capture in Calotriton and Euproctus has been interpreted as an adaptation to stream habitats (Salthe, 1967) and has occurred independently in these genera (Steinfartz et al., 2006). Male-mediated visual courtship displays, the only known case of visual courtship cues among all salamanders, have evolved independently multiple times in Triturus (sensu Steinfartz et al., 2006). Phylogenetic analyses (Titus and Larson, 1995) suggest that egg-laying is ancestral for salamandrids and that the live-bearing observed in Lyciasalamandra and Salamandra is evolutionarily derived. Presence of well-developed lungs is ancestral for salamandrids with five evolutionarily independent reductions or losses of lungs in the genera Calotriton, Chioglossa, Euproctus, Pachytriton, and Salamandra. Two cranial characters provide synapomorphies for subgroups of salamandrids (Titus and Larson, 1995). Presence of a frontosquamosal arch is a derived characteristic found in all newts (except Triturus) but no other salamanders. Fusion of the premaxillary bones in salamandrids is a synapomorphy of all newts excluding the genera Pleurodeles, Salamandrina and Tylototriton, although this character has arisen independently in other salamanders (see Wake and Larson, 1987). Other cranial characteristics show more complex patterns of evolution in the Salamandridae. AmphibiaWeb: Information on amphibian biology and conservation. [web application]. 2006. Berkeley, California: AmphibiaWeb. Available: http://amphibiaweb.org/. Chan, L. M., K. R. Zamudio, and D. B. Wake. 2001. Relationships of the salamandrid genera Paramesotriton, Pachytriton, and Cynops based on mitochondrial DNA sequences. Copeia:997-1009. Duellman, W. E. 1993. Amphibian Species of the World: Additions and Corrections. Univ. of Kansas Printing Service. Lawrence, Kansas. Frost, D. R. 2006. Amphibian Species of the World: an Online Reference. Version 4 (17 August 2006). Electronic Database accessible at http://research.amnh.org/herpetology/amphibia/index.php. American Museum of Natural History, New York, USA. Griffiths, R. 1996. Newts and Salamanders of Europe. T & AD Poyser Ltd., London. Halstead, B. W. 1992. Dangerous Aquatic Animals of the World. The Darwin Press Inc. Princeton, New Jersey (published simultaneously by Mosby-Year Book, Inc. St. Louis, Missouri). Hayashi, T., and M. Matsui. 1989. Preliminary study of phylogeny in the family Salamandridae: allozyme data. Pp. 157-167 in M. Matsui, T. Hikida and R. C. Goris, eds. Current Herpetology in East Asia. The Herpetological Society of Japan, Kyoto. Houck, L. D. and S. J. Arnold. 2003. Courtship and mating behavior. Pp. 383-424 in D. M. Sever, ed. Reproductive Biology and Phylogeny of the Urodela. Science Publishers. Litvinchuk, S. N., Zuiderwijk, A., Borkin, L. J., and J. M. Rosanov. 2005. Taxonomic status of Triturus vittatus (Amphibia: Salamandridae) in western Turkey: trunk vertebrae count, genome size and allozyme data. Amphibia-Reptilia 26:305-323. Montori, A. and P. Herrero. 2004. Caudata. En: Amphibia, Lissamphibia. García-París, M., Montori, A., and P. Herrero. Fauna Ibérica, vol. 24. Ramos M. A. et al. (eds.). Museo Nacional de Ciencias Naturales. CSIC. Madrid: 43-275. Nussbaum, R. A., E. D. Brodie, Jr. and Y. Datong. 1995. A taxonomic review of Tylototriton verrucosus Anderson (Amphibia: Caudata: Salamandridae). Herpetologica 51:257-268. Özeti, N. 1967. Morphology of salamander Mertensiella luschani (Steindachner) and relationships of Mertensiella and Salamandra. Copeia:287-298. Özeti, N. and D. B. Wake. 1969. The morphology and evolution of the tongue and associated structures in salamanders and newts. Copeia 1969:91-123. Salthe, N. 1967. Courtship patterns and phylogeny of the urodeles. Copeia 1967:100-117. Sever, D. M. 1992. Comparative anatomy and phylogeny of the cloacae of salamanders (Amphibia: Caudata). IV. Salamandridae. Anatomical Record 233:229-244. Steinfartz, S., S. Vicario, J. W. Arntzen, and A. Caccone. 2006. A Bayesian approach on molecules and behavior: reconsidering phylogenetic and evolutionary patterns of the Salamandridae with emphasis on Triturus newts. Journal of Experimental Zoology Part B: Molecular and Developmental Evolution in press. Veith, M., C. Mayer, B. Samraoui, D. D. Barroso, and S. Bogaerts. 2004. From Europe to Africa and vice versa: evidence for multiple intercontinental dispersal in ribbed salamanders (genus Pleurodeles). Journal of Biogeography 31:159-171. Vences, M., and S. Steinfartz. 2004. When non-monophyly results in taxonomic consequences - the case of Mertensiella within the Salamandridae (Amphibia: Urodela). Salamandra 40:67-80. Veith, M., S. Steinfartz, R. Zardoya, A. Seitz, and A. Meyer. 1998. A molecular phylogeny of 'true' salamanders (family Salamandridae) and the evolution of terrestriality of reproductive modes. Journal of Zoological Systematics and Evolutionary Research 36:7-16. Wake, D. B. and N. Özeti. 1969. Evolutionary relationships in the family Salamandridae. Copeia 1969:124-137. Weisrock, D. W., J. R. Macey, I. H. Ugurtas, A. Larson, and T. J. Papenfuss. 2001. Molecular phylogenetics and historical biogeography among salamandrids of the "true" salamander clade: Rapid branching of numerous highly divergent lineages in Mertensiella luschani associated with the rise of Anatolia. Molecular Phylogenetics and Evolution 18:434-448. Weisrock, D. W., Papenfuss, T. J., Macey, J. R., Litvinchuk, S. N., Polymeni, R., Ugurtas, I. H., Zhao, E., Jowkar, H., and A. Larson. 2006. A molecular assessment of phylogenetic relationships and lineage accumulation rates within the family Salamandridae (Amphibia, Caudata). Molecular Phylogenetics and Evolution 41:368-383. Zhao, E., Y. Jiang, Q. Hu and Y. Yang. 1988. Studies on Chinese Salamanders. Society for the Study of Amphibians and Reptiles. Oxford, Ohio. David Buckley, David Heyse, Todd Jackman, David Maddison and Tom Titus contributed to the preparation of this Tree of Life page.